As a young dad, I was taught that “delayed obedience is disobedience,” and that kids should be required to immediately obey all parental requests. I disciplined accordingly, knowing that having obedient kids was a good goal. And, if I’m honest with myself, I liked the feeling of control and validation that came with having obedient kids. When our kids disobeyed, I was quick to respond with a rebuke and a consequence. Our oldest son Daniel was particularly strong-willed and defiant, and I was particularly hard on him. But my approach didn’t have the desired effect. As he grew from toddler to preschooler, Daniel grew more irritated by my discipline, and his general demeanor started becoming more angry and testy. I intensified efforts to “nip this in the bud” by using the commonly recommended practices for requiring obedience. The firmly delivered phrase, “Daniel, delayed obedience is disobedience, and you’ll be disciplined if you don’t obey immediately,” was commonplace. Sometimes he complied, and sometimes he did not, but we were both generally discouraged by the process. After some trial and error, and prayer and seeking, I realized maybe I was actually more disobedient than Daniel. 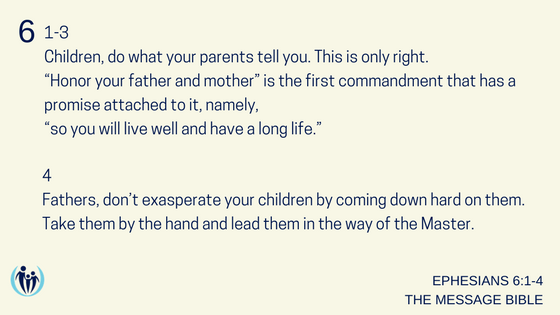 Yes, the Bible commands children to “obey your parents in The Lord,” (Eph 6:1), but I was working much harder on getting the kids to follow their verse than I was to obey the verse aimed at fathers a few sentences later. It turns out that perhaps the most direct of all commands in the Bible to fathers is found in both Colossians 3 and Ephesians 6:4. 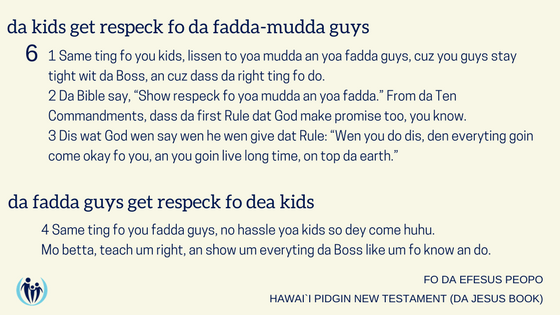 In short it says, “Fathers, don’t exasperate or embitter your children.” We love how The Pidgin Bible paints a more vivid picture than our English Bibles: we are warned not to make our kids huhu (crazy)! In my own “huhu” efforts to gain obedience, I was clearly disobedient. How? I yelled. I stood tall in order to intimidate my kids into submission. I scared them into doing things my way. I sought to emerge victorious. Which meant there was a subtle “I win and you lose” dynamic in my discipline. So I made “losers” of my kids. I did little to consider what was really best for my children, and instead disciplined from a sense of what was best for me. In other words, much of my discipline was selfish! Although I was well-intentioned, by exasperating my three kids, I was sinning against those precious ones entrusted to me. Once I confessed this to God, my kids, and my community, I could receive God’s grace for me. We’ve all disciplined selfishly, and fallen short of God’s best for us as parents. Receiving God’s grace for me helped me to focus on obeying my verse more than focusing on getting the kids to obey theirs. I then worked to bring God’s grace, truth, and mercy to their disobedience too; not in a way that let them off the hook for it, but in a way that built wisdom and reconciliation as I held them accountable. I learned to live out the full extent of my verse as described so beautifully in the Message, “Fathers, don’t exasperate your children by coming down hard on them. Take them by the hand and lead them in the way of the Master.” So I modeled more intentionally. I encouraged more. 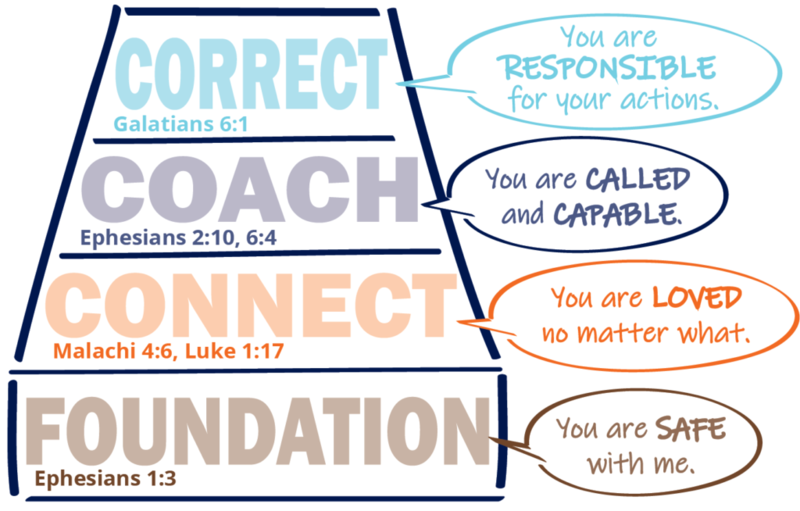 I learned to nurture values and skills that empowered my kids to desire obedience because they valued God’s ways. I’m so glad I made this shift. Today my kids’ memory of me is not as their dominator, but as their discipler – a loving and graceful daddy. Not perfect, but in Daniel’s words, I was “cosmically safe” (in the big picture of our relationship), because I was faithful to reconcile with grace whenever I slipped back into a big angry power reaction. I encourage you to commit to obeying your verse first and foremost. You just might find your kids more naturally follow their verse. But even if that takes a long time, you’ll have peace of mind knowing you’ve obeyed the Father that loves you and your kids deeply. Want to learn more? Jim recorded this 38-minute audio thinking about dads (although moms can listen too!). If your wife has recently been digging into our material and is urging you to “get on board!” this is a great place to start!